When buying a safe box, the heavier it is, the better. A thick exterior means it's less likely for the contents to get damaged in a fire, and heavy weight means a burglar will have a very tough time just ripping it from the wall and carrying it with him. Obviously, a thick exterior is also much harder to penetrate by force. If you can, try to get a concrete amalgamate-based composite fire safe and make sure it carries a lot of steel components. The fireboard, drywall-based fire safes, and any panel-based safe boxes can be a good budget-friendly option, but they provide a bit less safety in fire situations. The safe box door must be built to last. Essentially, it's one of the most important parts of a safe box. The alternatives are mostly a compromise between budget-friendliness and safety. For the best possible protection, you should look for a solid steel door with a minimum thickness of ½", and solid steel body with a minimum thickness of ¼". You see, steel can be quite expensive. The more of it the safe box contains, the more expensive it is to produce and the shipping costs can quickly go up as well. This is the reason why many safe box manufacturers make compromises during the manufacturing process to cut down the costs, so they can offer an affordable product that is still reasonably safe. But in the end, it's up to you to find the optimal balance between safety and affordability. In an ideal situation, go with a UL approved Group 2 quality lock; Sticking with a proven brand such as these will ensure that your lock will serve your for many years down the road without having to deal with an early failure. Beware of the no-name brands, however, since 95% of these are almost guaranteed to fail rather soon. If such a thing happens, even the most experienced locksmiths may have a hard time opening it without having to resort to forced entry, which does save your belongings, but renders the safe box unusable, leaving you with a hefty bill. So to keep it simple, if you see any of these brands, you can rest assured the safe uses a quality lock. Then again, quality locks aren't limited to these brands either, it merely means these are the most likely to stand the test of time. 4. Does the safe box have relockers? Relockers are basically another safety measure against burglars. If your safe box ever finds itself under attack, these hardened pins are triggered, which means the burglars would have to resort to drilling in order to access the safe by force. However, that would take them hours upon hours of time, which is more than enough for the police to be alerted and is something they cannot afford. 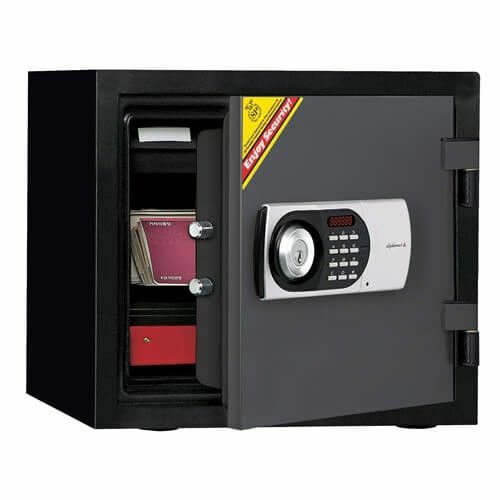 Depending on the size and burglary grade of the safe, you can expect to see anywhere from 2 to 10 of these in any particular model. Again, you should base your decision on what type of items you're going to store in your safe box, and choose a model accordingly. Some items are probably not as valuable to fret over. What is the safe box going to be used for? Can you make by with a smaller model, or will you need to store larger objects? There are all sorts of different models that come in different sizes and are made for different purposes, so you need to consider what you're mostly going to be using it for. Aside from that, you should install it in a place where you can reset the lock combination yourself without the aid of a locksmith. Also, it should be in a location that will provide quick access the safe. By following our safe box buying guide, you should now have a pretty good idea on what to look out for, and we are confident you will make a great buying decision. Make sure you try our Safe Box Selector, which will help you to find the right safe box within 10 seconds.